1. To calm the body, inhale, tensing the whole body; throw the breath out and relax. Repeat two or three times. 2. Inhale and exhale slowly and deeply several times. Make the period of inhalation, holding, and exhalation the same. (Suggested counts: 8-8-8, or 6-6-6.) Don’t strain. Repeat six or twelve times. 3. Mentally check the body to make sure it is relaxed. Periodically, check the body again during your practice of the technique. 4. Begin your actual practice of the technique by first exhaling, slowly and deliberately. 1. When the breath flows in of its own accord, follow it mentally with the sound,Hong. Imagine that the breath itself is making this sound. 2. When the breath flows out of its own accord, follow it mentally with Sau, and imagine that it is itself making, the sound, Sau (to rhyme with “saw”). 3. If at any time the breathing stops naturally, accept the pause calmly, identifying yourself with it until the breath flows again of its own accord. 4. To keep your mind on the breath (or, when you are more interiorized, to differentiate between inhalation and exhalation), it may help you to bring the forefinger towards the palm as the breath flows in, and away from the palm as the breath flows out. 1. If your breath is still restless, you may be more easily aware of the physical movement of your lungs and diaphragm than of the flow of breath in the nostrils. In this case, concentrate on the purely physical aspects of breathing — the movement of the rib cage, the diaphragm, or the navel. 2. Gradually, as you grow calmer, transfer your attention from the breathing process to the breath itself. 1. As your attention begins to focus on the breath itself, watch the breath at the point where it enters the nostrils. 2. Gradually, with the progressive calmness of the breath, center your awareness of it higher and higher in the nose. To raise this center of awareness, you may find it helpful if you make a special effort inwardly to relax your nose. 3. As it becomes natural to do so, center your awareness of the breath at the point where it enters the nasal cavity. Feel it in the upper part of this passage, and visualize its movement gently fanning and awakening the spiritual eye in the frontal lobe of the brain. 1. Become more and more identified with the breath, less and less with your body’s need for it to flow in and out. 2. Particularly concentrate on, and enjoy, the pauses between the breaths. Dwell on the sense of freedom from the tyranny of constant breathing. Beyond enjoying this sense of calmness and freedom, however, do not try to prolong the breathless state by an act of will. 3. Direct the will, rather, toward the thought of becoming the air that is flowing in the nose, or of becoming boundless space at the spiritual eye. 4. As the pauses become prolonged, you may want to engage your attention in chanting Aum mentally. 1. Throughout the practice of this technique, look upward so as gradually to raise your consciousness. Do not, however, concentrate at the spiritual eye until it becomes natural for you to feel the flow of the breath at that point. 2. Sit very still throughout your practice of the technique. Any physical movement (and also any unrelated movement of thought or emotion) will further excite the breath. 3. Every now and then, mentally check the body (especially the nose) to be sure it is relaxed. 4. While chanting Hong-Sau, be sure that you are chanting only mentally. Often, the mere thought of a word will produce an involuntary movement of the tongue or lips, or a slight tension in the jaw or throat. Be sure these parts of your body, too, are completely relaxed. 1. Timing and Regularity: Set aside the same time or times each day for your meditation. It’s easier to meditate on an empty stomach, so try not to set a time just after a meal. Meditate every day at your chosen time, even if it’s only five or ten minutes. If, for at least 30 days, you make a consistent effort never to skip a meditation, a supportive habit will start to form, and it will become easier. Warrior pose is great for giving you energy when you feel tired. 2. Exercise first: If you have time, exercise a little before you meditate. Yoga postures are an excellent way to relax the body and mind before meditation. Paramhansa Yogananda’sEnergization Exercises are also highly recommended. 3. Find a place: Set aside a room, or small part of a room, just for meditation. Try to find as quiet a spot as possible; if this is difficult, try using foam earplugs or headphones to block out the noise. Be sure the room is a little on the cool side and not stuffy; a blanket or shawl to wrap up in is nice. 4. Sitting: Protect yourself from the downward pull of earth currents by sitting on some natural fiber, like a wool or silk blanket or piece of cloth placed on your meditation chair, bench, or cushion. Sit Erect! Whether you sit on a meditation bench, pillow or on a chair, keep your back straight, chest raised, head erect, eyes closed, and hands resting palms upturned in your lap, preferably at the juncture of the thighs and abdomen. Click here to find out more information on how to sit comfortably for meditation. 5. How long: Do not set unrealistic goals for yourself. It is better to meditate 5 – 15 minutes and be very consistent with your practice, and then increase your time as you can. One longer meditation (2 -3 times longer) each week can help to deepen your meditations and also make your normal one seem short. It also helps to meditate with other people, especially with those who have been meditating longer than you. 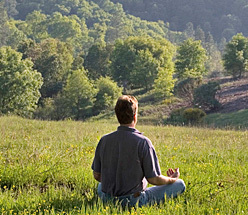 You’ll find that group meditations will often help you to meditate longer than you normally would on your own. 6. Begin your meditation: As you sit to meditate, it is very important to make a strong mental resolution to put aside all preoccupations and worries. Say a prayer inwardly or out loud to your higher self in whatever way feels right to you, asking for help and guidance. You may also listen to or play some uplifting music. Then practice the breathing exercises to relax: Inhale, tense the whole body, then throw the breath out and relax (do this 2 or 3 times). Then do some measured breathing: inhale, hold, and exhale, then begin again. Do this 6 – 12 times. Choose a count that is comfortable for you; anywhere from 6-6-6 to 12-12-12 or higher. Afterwards, relax and breathe normally, and become aware of your breath. 7. Techniques: Spend the majority of the meditation doing techniques that concentrate and interiorize the mind. Only when you are deeply concentrated and in a state of expanded awareness is it good to drop techniques and simply immerse yourself in the experience. 8. Remember to hold the body still: You can mentally check it from time to time to see that no part becomes tense again. Physical tension is a great deterrent to calm and deep meditations. Be very silent and relaxed, yet aware. 9. 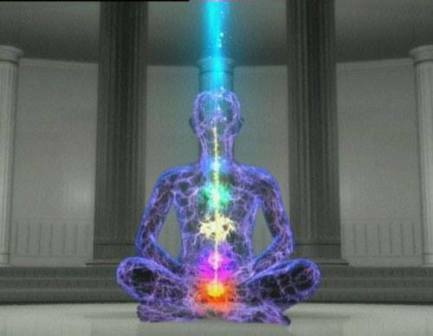 Meditate with joy: Meditation will help you to remember, on ever deepening levels, who you truly are.